Hate is a strange word. We all think we know what it means – and yet – we apply it to things – we don’t actually hate. When it comes to bullies – we all hate bullies. But – is that even a good response? No. It is not. 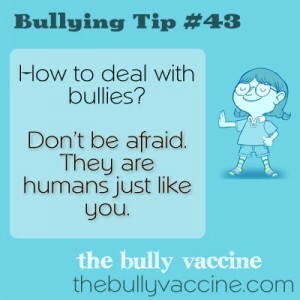 A bully is a human being. They are acting inappropriately. They are causing harm. But – like all human beings, they are doing what they think works – even if what they think works – isn’t really working for them. There are a variety of reasons why bullies bully. Some bully adaptively – meaning – they do it because when they are aggressive – they get their way. They aren’t really thinking about the impact they are having on others – they just know – they got their way. They aren’t doing it to harm others – they just want to get their way. Others – bully maladaptively – meaning – something else is wrong and they don’t know how to cope – so they use aggression to lash out – hoping that if they can control others – they will get control over whatever is wrong. It doesn’t really work which is why it’s considered maladaptive. But again – their goal isn’t to harm someone. It’s to help themselves. And that difference matters. Finally – there is a small subset of the population that is sadistic and likes to see other people suffer. Very few people you meet – are going to fall into this category. And even if you do – something is very wrong with them and they are doing it to make themselves feel good. Should you hate any of these people? You might hate how they are behaving. But hate them? Personally – I can’t see the point. What good exactly will you do – if you hate them? Will it fix your problem? No. Will it make you feel better? No – hate feels horrible. Will it make you feel superior? Probably – but – at what cost? Hate – doesn’t fix bullying problems. It doesn’t make us feel better. And it doesn’t work. It just makes you angry and helps you justify your anger. So – instead of being happy – you walk about in a state of anger – just getting angrier and angrier. There are better ways to live your life and better ways to deal with obnoxious people. Don’t allow a bully to turn you into a jerk. Learn how to stop them using science based techniques that allow you to be a good happy person – and still make the bullies stop. The best way to handle a bully – is to not let them make you suffer.